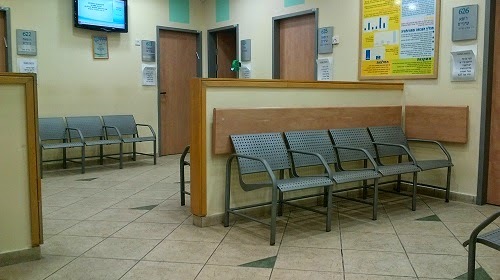 Empty medical clinic in Haifa. It's not always about me. Sometimes, the hardest things about aliyah are more about the kids. But then, sometimes life sends small mercies, and I am grateful, even as my heart breaks at what I used to take for granted. My family is sick of hearing me say it by now. Every time one of them complains about life's mundane annoyances, like bad service from a phone company, or having to deal with some kind of bureaucratic situation, I just keep telling them, "at least it's in English." 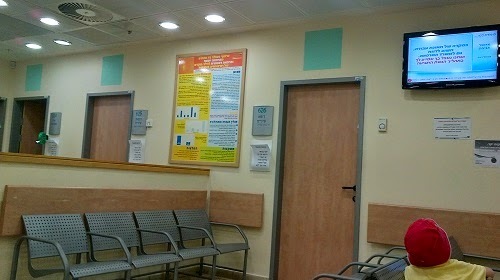 Maybe someone has told you that "all doctors in Israel speak English"? Lots of people said it to me, both before and after we came. Reassuring me that at least in the most dire circumstances, you'd be able to get help in a language you understand. Turns out that in predominantly Russian areas like ours, that's not quite true. Doctors may have mastered some key medical terminology in English, but their speaking ability is often very limited. Last year, when GZ hurt his chin, my heart broke for how overwhelming things must have been for him. In pain, surrounded by doctors and nurses yelling in a language he didn't understand at all. "Explain to him!" one nurse kept yelling. "Tell him if he doesn't co-operate, he'll have to go to the hospital." Yeah, that didn't help, at all. Whether you're small or big, medical situations can be overwhelming. But at least if you're an adult, you have some prior experience. For kids, it's all new and bewildering, in any language. Even GZ's routine eye appointment back in June was a trial, albeit a less painful one than the chin. We saw a nurse first who did a basic vision check. An older Russian-speaking lady, she assumed right away that he was not co-operating when she asked him to read out some numbers. The numbers were small than the ones on the clock on our wall. Which he cannot see without glasses. She asked him to read, in Hebrew, and he shook his head. So she said, "Maybe he doesn't know how to read?" "He knows how to read," I said. "He knows numbers." This is a kid who reads chapter books and adds and subtracts at a first-grade level. "He just can't see," I told her. Don't they get lots of kids who can't see without their glasses? Apparently, he was the first she'd ever met. "If he doesn't co-operate, then he can't see the doctor." Huh? So I told him to either try his best or say he can't see. But he still couldn't satisfy her demands. Finally, she shook her head, got up, and said, "I'll have to ask the doctor." The eye doctor was a saner sort, apparently, because she agreed to see him even though he wasn't very good at seeing. Once in the actual doctor's office, he was fine. I showed him where to sit and translated her instructions for him. He sat, he read, he peered through her little goggles thing, and she wrote a prescription. Proudly remembering how to say "muscles," I mentioned that his eye doctor in Canada had wanted him followed up for possibly lazy eye muscles and/or strabismus and/or I don't know what. When he's tired, his eyes sort of wander off and do their own thing. So she scribbled out a referral to a specialty called "ortoptika" and told me to phone for an appointment. I rewarded the kid for his bravery (and myself) with a fruit smoothie from the mall next door to the clinic. And that's where we went yesterday, three months later, with a long shlep to yet another strange medical situation. Eye doctors aren't all that scary, are they? But to GZ, any doctor is a potential needle assailant, and any trip away from home is torment. So he was already primed for disaster, scarily tense and jumpy as we waited in the deserted waiting room of the downtown clinic. But then... as he was tensed up, suddenly everything turned very, very civilized. The doctor, an older woman, called us in about five minutes ahead of our appointment time to a room filled with toys and decorations and stickers and photos of smiling children wearing glasses. After a minute, she switched to a very fluent, cultured European English. And she spoke directly to him. She was charming, she smiled, she had a clip-on Dora the Explorer attached to her glasses. She asked him questions, he answered, grinning at how easy her "tests" were. A year and a half ago, at his first eye doctor's appointment back in Canada with the friendly ophthalmologist who spoke English, he was so comfortable he made himself right at home in her big chair. I hadn't realized how badly I had wanted him to have an experience like that here in Israel. And yeah, I teared up. Here was this doctor, making an almost unnoticeably small effort to switch to her excellent English, speaking to him directly, assuming not that he's uncooperative but perhaps that he's simply overwhelmed. Helping him feel cared-for (in a medical setting? shocking!). Small mercies can feel very, very large... particularly when they are directed at our kids. After his appointment, we shlepped to a nearby grocery store where someone swore they had seen frozen blueberries (nope; they were blackcurrants - yuck). 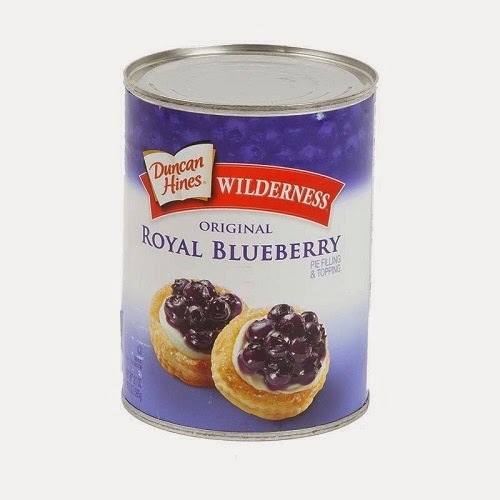 But I did manage to snag a tin of blueberry pie filling. Which is almost as good because that's exactly what I need the blueberries for anyway. The blueberry pie filling in local stores is bad to the point of nastiness; it has an odd, chemical taste that left me completely unable to eat any of the blueberry buns I painstakingly made a few months ago. And fresh blueberries, I believe, simply don't grow here. Which brings me all the way around the world to another moment, when I was sitting shiva for my brother, back in June. And there, all of a sudden, were blueberries. 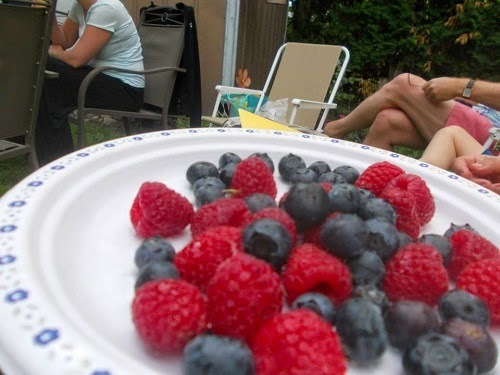 Plates and plates full of blueberries. Year-round blueberries. Local blueberries, imported blueberries, frozen blueberries. I may have cried at those too, but then, I was crying easily that week. The things you take for granted... until they're gone. Like blueberries. We have so much more here in Israel that most of the time it's worth it. But especially when it comes to our kids, sometimes I just want things to be easy for them. And sometimes, it actually is. Some days, just when you expect life to give you blackcurrants, what you come home with is a handful of blueberries instead. That's true. Friends of ours went cherry picking in the Golan. But it was a VERY hot day and we don't have a car. Maybe next summer! Black crocheted kippah, on judgment.